Technically speaking the CoA tool was not reporting your own ancestry! Rather it was listing the self-reported nationalities of your matches grandparents. This first of all created the possibility of erroneous entry in 23andme’s customer survey. And even more importantly this type of customer generated data could also be flawed because of mixed origins for your matches beyond two generations or beyond their knowledge. Also of course nationality does not equate ethnicity. As many countries are in fact multi-ethnic. For example a match with 4 self reported grandparents from Angola could very well be ethnically Portuguese due to Portugal’s longstanding colonial presence in Angola. The MRCA (most recent common ancestor) shared between you and your matches will therefore not per se have the same background as your matches themselves. Especially due to migrations there are usually several possible ancestral scenario’s to consider when you get “matched” with someone. Assumptions about the direction of gene flow may be proven wrong after follow-up research. Context is everything and historical plausibility combined with solid genealogical research should be leading instead of wishful thinking. The database composition of 23andme’s CoA tool greatly influenced the outcomes. Because 23andme is an USA based company it’s only natural its customers are also overwhelmingly American and mostly of European descent. Luckily the USA is home to many 1st or 2nd generation migrants from all over the world which still enabled a fairly global representation within the CoA tool. Nonetheless because of this skewed database factor for Afro-Diasporans there was always an inherent bias towards being matched with white Americans rather than actual Africans. Especially in the early days (2010-2015) when DNA testing was not yet as popular as it now is among minorities. While in particular African DNA testers were very rare (see this link for an estimate made in 2011). Notice how Cape Verde is correctly displayed as top ranking country. However aside from Morocco no other African countries are being shown. While Cape Verde’s shared Iberian ancestral connections are properly represented by Portugal, Spain and Latin American countries. Such a skewed outcome towards shared European lineage matches was pretty standard for other Afro-Diasporans as well. African DNA matches being prized rarities. Basically the same ranking patterns being repeated. But with a higher degree of reliability because of the 10cM threshold. Due to historical plausibility shared Iberian/Portuguese lineage seems to be indicated firstmost. With MRCA’s not originating in Cape Verde but rather in Portugal or Spain. Although shared African lineage might theoretically also be a possibility in some cases. In April 2018 however 23andme’s Ancestry Composition was finally being updated or rather expanded by the Recent Ancestor Locations (see upcoming blog post for review). This addition basically appears to be a stripped down version of 23andme’s former CoA tool (which still was much more informative…). Inspired by this flashback I am now publishing an overview of CoA results for 75 Africans: highlighting their Afro-Diasporan matches. But also showcasing their intra-African matches. Despite being somewhat outdated I do believe these African CoA results can still reveal relevant tendencies in DNA matching. I intend to compare these preliminary matching patterns eventually with my more recent findings for Africans who tested on Ancestry. 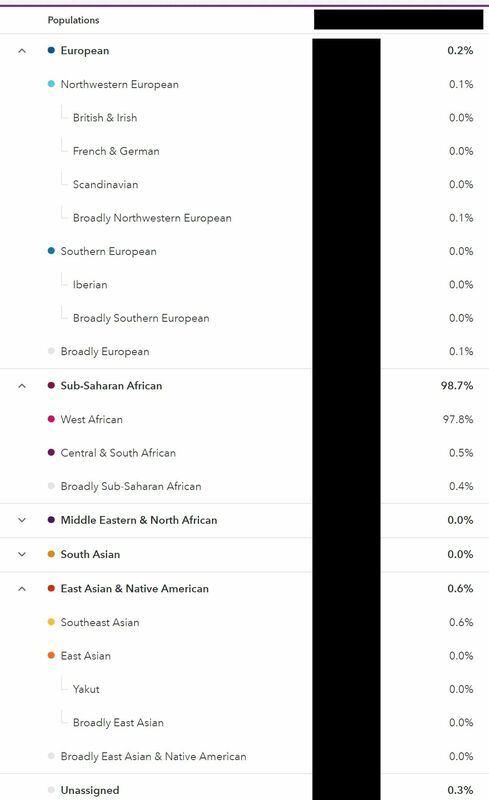 The layout of my main survey findings above was partially inspired by the dots which are being used in 23andme’s latest update/addition: Recent Ancestor Locations. The number of coloured dots indicate the match strength of the USA matches being reported for my African survey participants. The average of the CoA scores, “percent of genome covered”, for USA (set at 7cM) serving as a basis for this match strength. Zero dots implying that no USA matches were being reported (set at 7cM). On average a CoA score of 0.1% seems to have equaled one single match in most cases. I applied a somewhat arbitrarily defined range of CoA %’s for each dot as I wanted it to be illustrative of similar ranking firstmost. 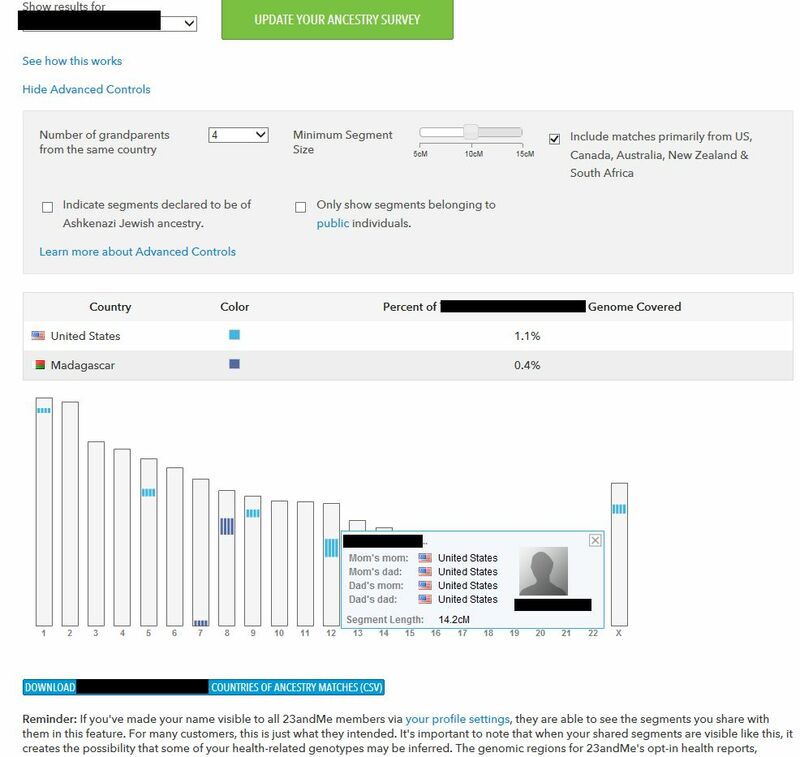 I verified the background of all my African survey participants by way of their ancestry composition on 23andme, surnames and whichever other ancestral details they kindly shared with me. I am not fully certain about their ethnic background in all cases. See also remarks below each individual screenshot. I have sorted the results according to several subcontinental regions and I also subdivided the West African results into Upper Guinea & Lower Guinea in order to obtain a more in-depth overview of the matching patterns. Brazil is included in the Latino matches and Belize, Haiti, Guyana & Surinam are included in the Caribbean matches. I did not specify CoA matches set at 5cM in the overview above because these smaller matches are generally deemed to be unreliable. However I do think they can have informational value (when interpreted correctly) and therefore I do mention them below while posting each individual result. At times I could not list all of the 5cM matches however. This is due to limitations of the screenshots I made at the time (no scrolling enabled :D.
I have only included the CoA results reported for matches with 4 grandparents from the same country. Usually more matches appeared when a more relaxed setting was chosen (1 grandparent from same country). Often also relevant and interesting ones. But the mixed background of these matches tends to complicate any straightforward interpretation. Keep in mind that this survey is based on CoA results which I screenshotted in November 2015. Therefore they firstmost represent a snapshot of 23andme’s customer database in 2015. Because of ever increasing popularity of DNA testing these CoA results would naturally look different when calculated today. Although I strongly suspect most of the matching patterns would still broadly be the same. The matching patterns I am describing are therefore based on 75 African individuals and their matches within a customer database which probably included atleast 13.000 people of African descent (combining African Americans and Latino’s) and possibly even somewhat more (unknown number of Africans & Caribbeans + database increase in 2015). Obviously individual variation will still be relevant but given that 75 Africans are being compared for similar DNA with thousands of Afro-descendants, the implications are already quite significant I would say. In particular for African Americans, presumably the biggest subgroup of Afro-Diasporans in the CoA tool. However not all of the USA matches are African Americans per se. Theoretically speaking they could also be persons who happened to have 4 USA born grandparents but beyond that their family could be from elsewhere. Also some white Americans might actually be included in the USA matches! 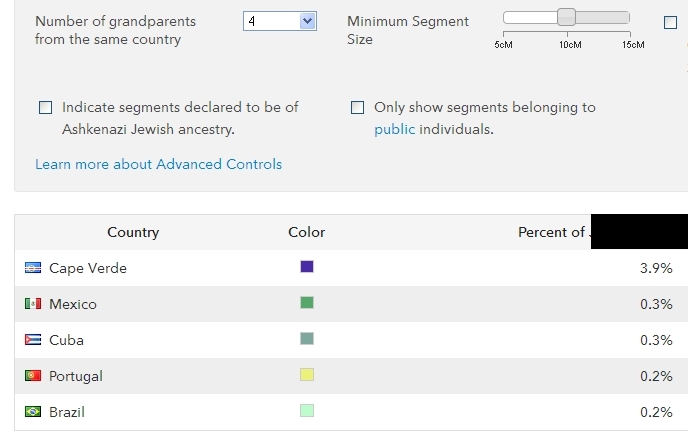 Certain African countries will tend to be overrepresented in 23andme’s customer database. Notably English speaking countries such as Nigeria and Ghana. While Portuguese or French speaking countries such as Angola and Benin are underrepresented for the most part. This situation creates more chances of being matched with for example your Nigerian lineage but does not invalidate that you might still also have Beninese or Angolan ancestry in addition. This is mostly due to these countries’ migrant presence in the US/UK (see this graph for biggest groups in USA in 2015). This is also reflected in the composition of my 75 African survey participants, in which Nigerians (n=17) & Ghanaians (n=10) clearly formed the greatest subgroups. Although actually my survey’s coverage across the continent is still already quite impressive. But just not so proportionally speaking. In the CoA tool it was possible to select matches of various segmentsize. Ranging from 5cM to 15cM. Generally speaking the 10cM threshold was recommended because of increasing chances of false positives for smaller matches. I have however chosen to center my survey mostly on the 7cM threshold because I found it most informative and still reasonably in line with IBD requirements as 23andme also uses this threshold for their DNA relatives tool. I have however still kept track of the 10cM matches as well. Because they will indicate more robust matching patterns. 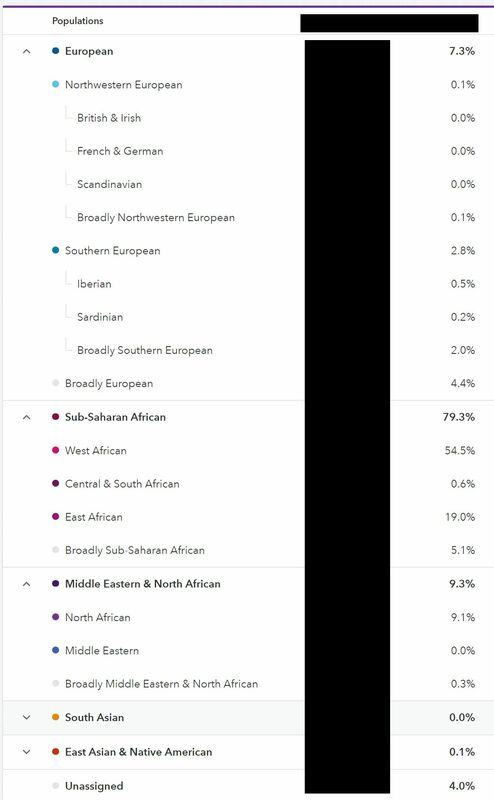 While verifying the background of each survey participant I came across a few persons who showed minor European admixture. Mostly from Upper Guinea, but also one Ghanaian and one South African. These European admixture scores go beyond possibly noise level (<0.1%). 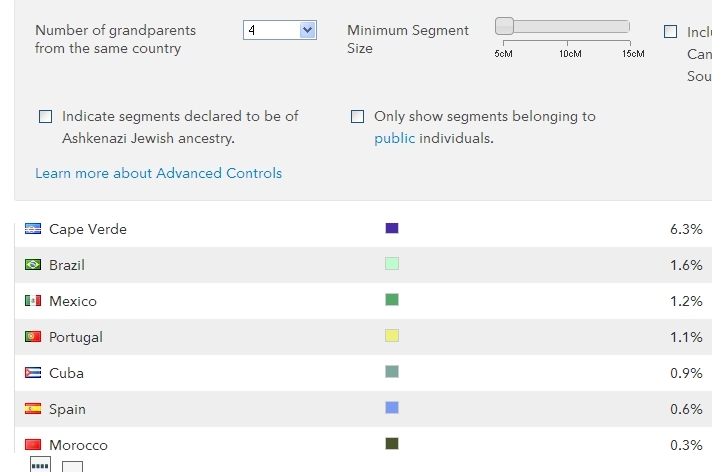 And at times they are quite substantial given that 23andme’s algorithm for its Ancestry Composition tool seems to be well equipped to pick up on minor amounts of continental admixture. Intriguingly also my Fula and Malagasy survey participants all showed some minor European admixture1. Therefore it cannot be ruled out that some of the matches being reported might be due to shared European lineage. Given the inherent bias of 23andme’s customer database towards European DNA this could even result in a disproportionate number of matches despite the minimal amount of detected European lineage. It is often said that admixture analysis should be taken with a grain of salt. Rightfully so as it can only provide (informed) estimates about your ancestral make-up. Then again valuable insights are still to be gained when these estimates are interpreted correctly. As a cautionary measure we might also say that DNA matches are not to be taken at face value either. As in fact they can sometimes be misleading as well when there is a lack of relevant context or when you are dealing with smaller matches (< 7cM). As always it pays to use scrutiny and discretion in stead of jumping to conclusions or putting all your eggs in just one basket! Be critical of the claims made by DNA testing companies. But at the same time aim for maximizing informational value despite imperfections. Combining your admixture results with your DNA matches will often lead to enhanced insights and complementarity. Add in proper historical & genealogical research and your multi-faceted strategy to Trace African Roots will be optimized and poised for verifiable breakthrough discoveries! Below I will provide an overview of the main findings I am able to pick up on from my survey results. Also for each subregion of Africa I will list my observations about what stood out the most to me. I will eventually compare notes with my findings for Africans and their matching patterns on Ancestry in more detail. This overview is just part of an exploratory exercise and not meant to be conclusive. Obviously everything I have already listed above is also to be kept in mind! The number of 10cM+ matches was rather high. And mostly confirming the matching patterns when set at 7cM. Perhaps tellingly not a single match of 10cM+ was reported for my East African survey participants. At least no matches with Afro-Diasporans. The least number of matches of any size and from anywhere was being reported for my survey participants from South Sudan (0x) and Uganda (1x). In regards to the match strength with the USA the three top ranking countries are Guinea (Fula), Madagascar and Nigeria (Igbo). Especially one Fula person from Guinea as well as two Malagasy survey participants received an amazing number of USA matches. Often also with a large shared segment size. Their minor European admixture might be a factor (see considerations). 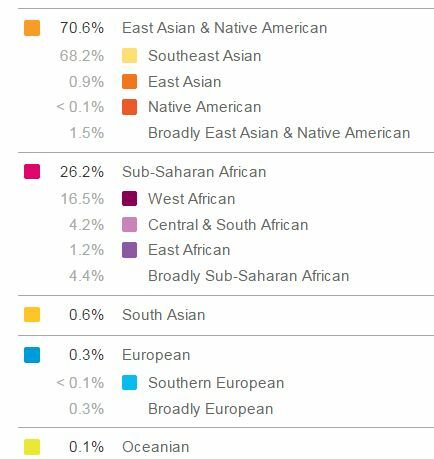 But I suspect not decisively so as the shared segments I was able to verify myself were either African or Asian in chromosome view. My Igbo survey participants also received many USA matches, strikingly more so than Nigerians of other ethnic background in my survey. Intra-African matches were reported quite frequently for most of my African survey participants. Even when the number of Africans in CoA’s database must have been very small! This includes matches from the same African country, matches from neighbouring African countries and in a few cases matches from unexpected countries in other parts of Africa, geographically far removed. When set at 5cM these presumably population matches become even more apparent. This outcome may hold some far-reaching implications. Afterall if a Kenyan is able to get a Zimbabwean match seemingly due to the genetic legacy of the Bantu Expansion from many centuries or even several millennia ago might then also likewise African Americans receive Kenyan matches due to shared Bantu origins from Central Africa (Angola/Congo)? 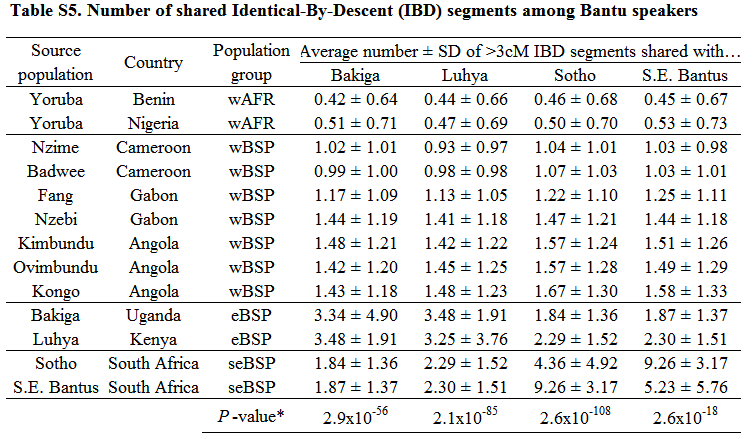 In a recently published research paper it was revealed that Angolans were having IBD matches with people from South Africa and also from Kenya/Uganda! Below screenshots are all taken from people who have kindly agreed to share their results with me2. For which I am very grateful! They were either born in the African country highlighted or have both parents from that country. These are obviously first of all individual results and very limited in number because there were only very few Africans yet who had tested with 23andme in 2015. 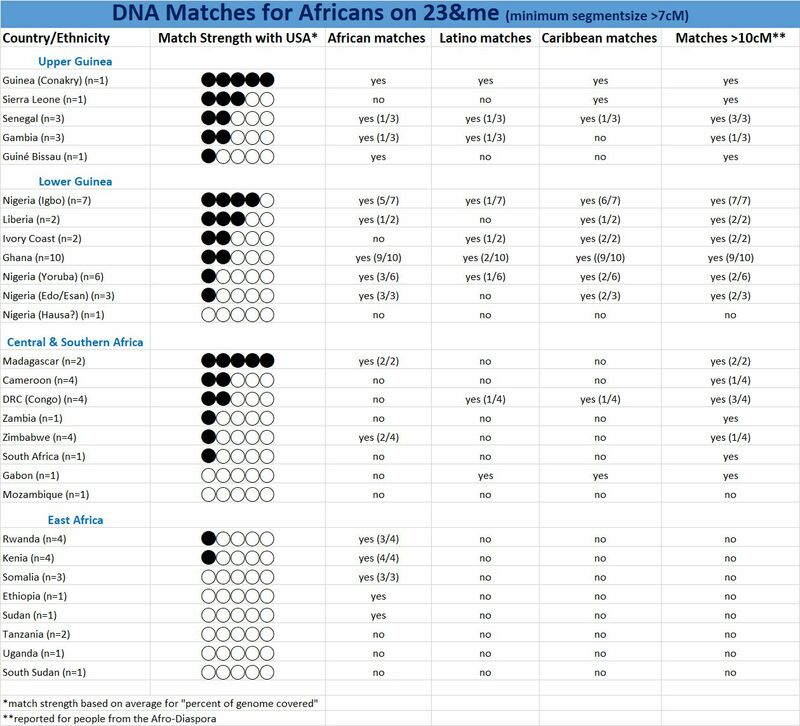 Undoubtedly with more African 23andme CoA results available you might see different or additional matching patterns. Still I think in most cases these screenshots below would be representative to some degree for how other people from their nationality or ethnic group would have scored hypothetically speaking . All parts of the Afro-Diaspora (Trans Atlantic) are well represented. But aside from the USA especially for Hispanic Americans this area seems somewhat prominent. Even if mostly expressed in distant and smaller matches (<7cM). The Guinean (Fula) profile really stands out in the number of Afro-Diasporan matches as well as the impressive segment size with many of these matches. Only equalled by the two Malagasy profiles. Likely ethnicity (based on surname): Wolof? Perhaps also distant & diluted European lineage as suggested by a 1.5% European score for this person. Although a mislabeling of North African DNA is also plausible1. Likely ethnicity (based on surname): Wolof? Perhaps also distant & diluted European lineage as suggested by a 1.9% European score for this person. Although a mislabeling of North African DNA is also plausible1. 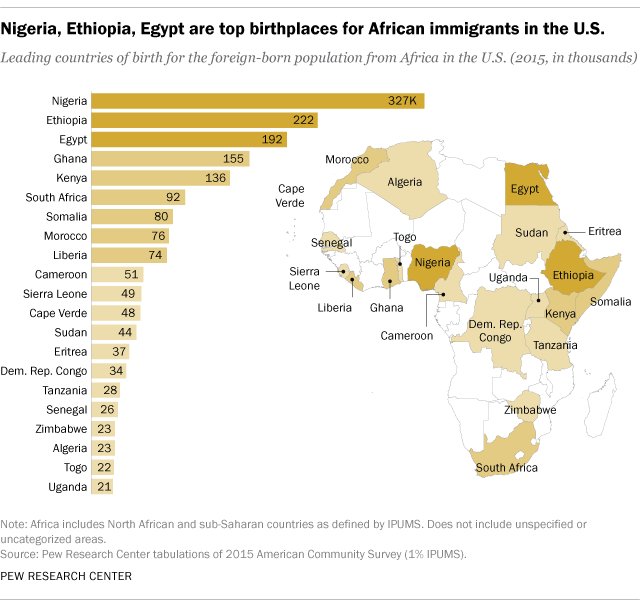 Likely ethnicity (based on surname & AC): Wolof & Fula. Perhaps also distant & diluted European lineage as suggested by a 5.2% European score for this person. Although a mislabeling of North African DNA is also plausible1. Likely ethnicity (based on surname & AC): Aku/Krio & Fula? Perhaps also distant & diluted European lineage as suggested by a 3.0% European score for this person. Although a mislabeling of North African DNA is also plausible1. Matches set at 5cM: USA, Nigeria, Guyana, Sierra Leone, Mexico, Liberia, Guinea (and more). Likely ethnicity (based on surname & AC): Mandinka? Perhaps also (very) diluted European lineage as suggested by a 0,6% European score for this person. Although a mislabeling of North African DNA is also plausible1. Matches set at 5cM: USA, Puerto Rico, Nigeria, Jamaica. Likely ethnicity (based on surname & AC): Serahule & Fula? Perhaps also distant & diluted European lineage as suggested by a 1.9% European score for this person. Although a mislabeling of North African DNA is also plausible1. Matches set at 5cM: USA, Guinea, Puerto Rico. Confirmed ethnicity: Mandinga, perhaps also (very) diluted European lineage as suggested by a 0,6% European score for this person. Although a mislabeling of North African DNA is also plausible1. Matches set at 10cM: USA (1 segment). Matches set at 5cM: USA, Cape Verde. Confirmed ethnicity: Fula. Perhaps also distant & diluted European lineage as suggested by a 7.3% European score for this person. Although a mislabeling of North African DNA is probably more plausible1. Matches set at 5cM: USA, Dominican Republic, Guinea, Puerto Rico, Gambia, Nigeria, Jamaica, Brazil, Mexico, Haiti, Guyana, Costa Rica, Bahamas. Likely ethnicity (based on surname & AC): ? Matches set at 10cM: USA (4 segments); Jamaica (1 segment), Haiti (1 segment). Matches set at 5cM: USA, Jamaica, Haiti. All parts of the Afro-Diaspora (Trans Atlantic) are well represented. But aside from the USA especially for English speaking Caribbeans this area seems prominent. West Indians were particularly frequent among the matches for my 10 Ghanaian survey participants. Mostly consistent across the whole range of segment sizes (5cM-15cM). Intra-African matches are frequent, especially when also including matches <7cM. Usually just covering neighbouring countries. But at times also more distant countries are mentioned. 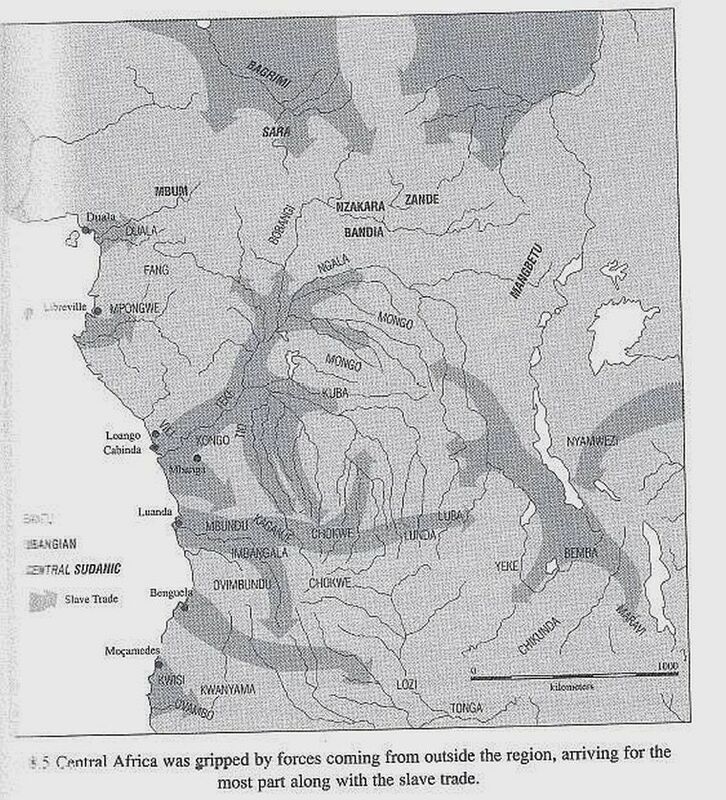 For this area of Africa it seems that both the Fula & Krio migrations might explain some of the more puzzling (at first sight) connections. Matches set at 10cM: USA (2 segments), Haiti (1 segment). Matches set at 5cM: USA, Haiti, Sierra Leone. Likely ethnicity (based on surname & AC): Krio? Perhaps also (very) diluted European lineage as suggested by a 0.2% European score for this person. As well as 0.6% Southeast Asian! Matches set at 10cM: USA (9 segments). Matches set at 5cM: USA, Saint Vincent, Nigeria, Ivory Coast, Barbados. Confirmed ethnicity: Malinké. Perhaps also (very) diluted European lineage as suggested by a 0.8% European score for this person. Although a mislabeling of North African DNA is also plausible1. Matches set at 10cM: USA (4 segments), Puerto Rico (1 segment). Matches set at 5cM: USA, Virgin Islands, Puerto Rico, Jamaica. Likely ethnicity (based on surname & AC): Malinké? Matches set at 5cM: USA, Haiti, UK, Nigeria, Guyana, Ghana, Barbados. Matches set at 10cM: Ghana (3 segments), USA (2 segments); Trinidad & Tobago (1 segment). Matches set at 5cM: USA, Ghana, Trinidad & Tobago, Puerto Rico, Jamaica, Colombia, Cuba. Matches set at 10cM: USA (5 segments), Ghana (3 segments), Barbados (1 segment). Matches set at 5cM: USA, Ghana, Jamaica, Barbados, Puerto Rico, Colombia, Mexico (and more). Confirmed ethnicity: 3/4 Akan & 1/4 Ga.
Matches set at 10cM: Jamaica (1 segment), Ghana (1 segment). Matches set at 5cM: USA, Ghana, Jamaica, Saint Vincent, Haiti. Likely ethnicity (based on surname & AC): Ga? Perhaps also distant & diluted European lineage as suggested by a 3.0% European score for this person. Most likely accounting for the unexpected UK & South Africa matches. Matches set at 10cM: unknown. Matches set at 5cM: USA, Ghana, UK, Surinam, South Africa (and more). Likely ethnicity (based on surname & AC): Akan? Matches set at 10cM: Barbados (1 segment), USA (1 segment), Ghana (1 segment). Matches set at 5cM: USA, Barbados, Ghana, Dominica, Jamaica, Grenada. Matches set at 10cM: Ghana (3 segments), USA (1 segment). Matches set at 5cM: USA, Ghana, Jamaica, Belize, Barbados. Likely ethnicity (based on surname & AC): Akan? Perhaps also (very) diluted European lineage as suggested by a 0.4% European score for this person. Matches set at 10cM: Ghana (4 segments), USA (5 segments). Matches set at 5cM: USA, Ghana, Trinidad & Tobago, Puerto Rico, Dominican Republic. Matches set at 10cM: USA (3 segments), Ghana (1 segment), Jamaica (1 segment). Matches set at 5cM: USA, Ghana, Jamaica, Barbados, Haiti. Matches set at 10cM: USA (2 segments), Surinam (1 segment), Guyana (1 segment), Trinidad & Tobago (1 segment). Matches set at 5cM: USA, Ghana, Surinam, Guyana, Dominican Republic, Brazil, Trinidad & Tobago. Matches set at 10cM: Jamaica (1 segment), USA (1 segment). Matches set at 5cM: USA, Jamaica, Ghana, Colombia. Likely ethnicity (based on surname & AC): Igbo? Matches set at 10cM: USA (8 segments), Dominica (1 segment), Jamaica (1 segment), Nigeria (1 segment). Matches set at 5cM: USA, Jamaica, Dominica, Nigeria, Grenada, France/Martinique (and more). Matches set at 10cM: Nigeria (2 segments), USA (3 segments). Matches set at 5cM: USA, Nigeria, Jamaica, Ghana. Matches set at 10cM: USA (11 segments), Jamaica (1 segment). Matches set at 5cM: USA, Jamaica, Nigeria, Brazil. Matches set at 10cM: USA (6 segments); Jamaica (1 segment). Matches set at 5cM: USA, Jamaica, Nigeria, Puerto Rico, Haiti, Guyana, Guinea-Bissau. Matches set at 10cM: USA (3 segments), Nigeria (1 segment). Matches set at 5cM: USA, Nigeria, Jamaica, Surinam, Puerto Rico, Guyana, Barbados. Matches set at 10cM: USA (12 segments). Matches set at 5cM: USA, Jamaica, Trinidad & Tobago, Martinique, Dominican Republic, Dominica, Bahamas. Matches set at 10cM: USA (2 segments); Surinam (1 segment), Saint Vincent (1 segment). Matches set at 5cM: USA, Jamaica, Nigeria, Australia, Surinam, Saint Vincent. Likely ethnicity (based on surname & AC): Yoruba? Matches set at 10cM: none. Matches set at 5cM: USA. Matches set at 5cM: USA, Nigeria, Dominican Republic, Cuba, Mexico, Jamaica. Likely ethnicity (based on surname & AC): Yoruba muslim? Matches set at 10cM: USA (1 segment), Haiti (1 segment). Matches set at 5cM: USA, Nigeria, Brazil, Haiti, Colombia. Matches set at 10cM: Nigeria (1 segment). Matches set at 5cM: USA, Nigeria, Dominican Republic, Barbados. Matches set at 10cM: USA (2 segments), Nigeria (1 segment). Matches set at 5cM: USA, Nigeria, Jamaica. Matches set at 10cM: Nigeria (2 segments), USA (2 segments). Matches set at 5cM: USA, Nigeria, Ghana, Cuba. Matches set at 10cM: USA (2 segments). Matches set at 5cM: USA, Jamaica, Nigeria, Mexico, Barbados. Matches set at 5cM: USA, Nigeria, Saint Vincent, Venezuela, Jamaica, Guyana, France (Guadeloupe), Dominican Republic, Canada, Belize, Bahamas. Likely ethnicity (based on surname & AC): Hausa-Fulani? Matches set at 5cM: USA, Nigeria, Guinea, Barbados. Hardly any West Indian matches being reported, even when set at 5cM. Haitian matches do appear though at times and also Latin American matches (incl. Brazil) are more noticeable. Intra-African matches are uncommon, except at the minimal segment size of 5cM. Probably just reflecting the paucity of Central African testers within CoA’s database. For this area of Africa it seems that Bantu migrations will be most relevant to explain any unexpected population matches. Matches set at 5cM: USA, Uganda, Costa Rica. Matches set at 5cM: USA, Cameroon. Matches set at 5cM: USA, Brazil, Nigeria, Jamaica. Matches set at 10cM: Dominican Republic (1 segment). Matches set at 5cM: USA, Trinidad & Tobago, Puerto Rico, Dominican Republic, Cameroon, Venezuela. Matches set at 10cM: USA (5 segments). Matches set at 5cM: USA, Jamaica, Reunion, Haiti, Guatemala, Dominican Republic, Cuba (and more). Matches set at 5cM: USA, Turkey, South Africa, DRC Congo, Brazil, Bahamas. Matches set at 10cM: USA (3 segments), Haiti (1 segment). Matches set at 5cM: USA, Dominican Republic, Venezuela, Saint Kitts & Nevis, Haiti, Guyana, El Salvador (and more). Confirmed background: northern DRC & Angola. Matches set at 5cM: USA, Haiti, Mexico, Dominica, Panama, El Salvador, Angola. Matches set at 5cM: USA, Colombia, Brazil, Mexico, Kenya. Hardly any West Indian or Latin American matches being reported, even when set at 5cM. Intra-African matches are quite frequent. For this area of Africa it seems that Bantu migrations will be most relevant to explain any unexpected population matches. There also was one atypical Ghana match (>7cM) being reported for a Zimbabwean. Aside from possibly just being a IBS glitch perhaps this person’s specific family tree might also offer an explanation. A surprising number of Asian matches (set at 5cM) appeared for both of my Madagascar survey participants. Aside from Philippines also including rather unexpected countries such as Vietnam, China and Japan (!). Given that Southeast Asian migrations into Madagascar are generally thought to have occurred more than a thousand years ago these matches only seem to make sense as (very) generic population matches. Illustrating how genetic similarity and not actual shared descent (within a time frame of 500 years) can be the underlying cause of some of your more surprising matches. Matches set at 10cM: USA (10 segments), Reunion (1 segment). Matches set at 5cM: USA, Reunion, Philippines, Madagascar, South Africa, Somalia, Kenya, Japan, China, Barbados, Australia. Matches set at 10cM: USA (5 segments), Madagascar (2 segments). Matches set at 5cM: USA, Madagascar, South Africa, Mauritius, Reunion, Vietnam, Philippines, Seychelles, Panama, Kuwait, France, Cuba, China. Confirmed background: northern Mozambique & Malawi. Matches set at 5cM: USA, Nigeria, South Africa, Haiti, Dominican Republic, DRC Congo (and more). Matches set at 10cM: USA (1 segment), Zimbabwe (1 segment). Matches set at 5cM: USA, Zimbabwe, South Africa, UK, UAE, Saudi Arabia, Kenya (and more). Matches set at 10cM: Zimbabwe (1 segment). Matches set at 5cM: USA, Zimbabwe, Madagascar. Matches set at 5cM: USA, Zimbabwe, UAE, Mexico, Guyana, Colombia (and more). Matches set at 5cM: USA, Kenya, Haiti, Trinidad & Tobago, Zimbabwe, South Africa (and more). Likely ethnicity (based on surname & AC): Bantu speaker. Perhaps also distant & diluted European lineage as suggested by a 0.2% European score for this person. Matches set at 5cM: USA, Dominican Republic, Zimbabwe, South Africa, Nigeria, Mexico, Kenya (and more). Only two 7cM+ matches appearing for USA. Tellingly perhaps one of them is for my only Rwandan survey participant who is quite likely Hutu. The other three Tutsi Rwandan persons in my survey did not receive any 7cM+ USA matches. Suggesting that possibly this match (as well as the Kenyan one) could represent a case of a generic population match due to Bantu migrations. My South Sudanese survey participant uniquely did not get any CoA result at all! Whichever setting being applied. This seems to be a testimony first of all of South Sudan’s isolated geographical location as well as 23andme’s customer composition. However I suppose it might also indicate how Nilotic populations from the deep interior were least affected by slave trade routes carrying captives outside of Africa. Intra-African matches are quite frequent. Aside from same country matches it seems that Bantu migrations will be most relevant to explain any unexpected population matches. The extent of these migrations is indicated by mutual matches between Kenyans & Zimbabweans! A few European matches (set at 5cM) appeared for some of my Northeast African (Somali/Ethiopia) survey participants. Including matches from the UK and Italy. In addition I also verified a few white American matches appearing under USA. It cannot be ruled out that specific family trees might offer an explanation in selected cases. But generally speaking this outcome seems to be caused by genetic similarity and not actual shared descent (within a time frame of 500 years). Afterall many Northeast Africans have substantial West-Eurasian DNA, even if to be traced back thousands of years ago and not hundreds, generally speaking. Confirmed ethnicity: Rangi and Sukuma. Matches set at 5cM: USA, UK, Kenya, India. Confirmed ethnicity: Luo & Hehe. Matches set at 10cM: Rwanda (1 segment). Matches set at 5cM: USA, Kenya, Brazil, Rwanda. Matches set at 5cM: USA, UK, Iran, Bolivia, Kenya. Matches set at 5cM: Rwanda, Kenya, USA. Likely ethnicity (based on surname & AC): Hutu? Matches set at 10cM: Kenya (1 segment). Matches set at 5cM: USA, Kenya, Brazil, Trinidad & Tobago. Likely ethnicity (based on surname & AC): Luo? Matches set at 10cM: Zimbabwe (1 segment), Kenya (1 segment). Matches set at 5cM: USA, Kenya, Zimbabwe, Uganda, Canada, Brazil. Likely ethnicity (based on surname & AC): Luo (Nyanza)? Matches set at 5cM: USA, Kenya, Uganda, Haiti, Dominican Republic, Comoros, Colombia (and more). Matches set at 5cM: USA, Kenya, Haiti, Uganda, Saudi Arabia, Puerto Rico, Ecuador. Confirmed ethnicity: Swahili & minor Kikuyu. Matches set at 10cM: Kenya (2 segments). Matches set at 5cM: USA, Kenya, Uganda, Haiti, Azerbaijan. Matches set at 10cM: Somalia (9 segments). Matches set at 5cM: Somalia, USA, Italy. Matches set at 10cM: Somalia (3 segments). Matches set at 5cM: Somalia, USA, Yemen, UK, Tanzania, Madagascar. Matches set at 10cM: Somalia (7 segments). Matches set at 5cM: Somalia, USA, South Africa. Matches set at 5cM: Ethiopia, USA, Eritrea. Likely ethnicity (based on surname & AC): Arab? Matches set at 10cM: Sudan (1 segment). Matches set at 5cM: USA, Sudan, South Africa, Saudi Arabia, Egypt, UAE (and more). Matches set at 5cM: none. Confirmed ethnicity: Aringa & Kakwa. Pirates, Merchants, Settlers, and Slaves Colonial America and the Indo-Atlantic World (K.P. McDonald, 2015). 2. I like to express my sincere gratitude to all my African survey participants! All results on this page have been shared with me directly by invitation. I have naturally taken great care to cut away any name details from the screenshots in order to safeguard everyone’s privacy. Apologies in advance to anyone who recognizes their results and is not comfortable with this blog page featuring them. Please send me a PM and I will remove them right away. 3. Based on the records available in the standard reference database of the Slave Voyages website this East African share in Trans-Atlantic Slave Trade might be less than 0.1% (=6324/6709327). 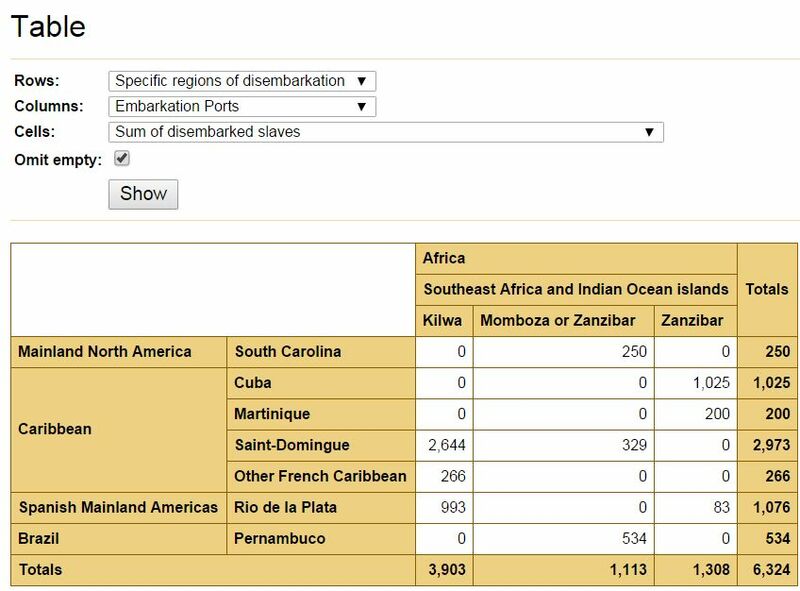 Comparing the total number (6,324) of disembarked captives for Kilwa, Zanzibar and Mombasa, all Swahili ports to the north of Mozambique, with the total number of disembarked captives from Southeast Africa (308,775, overwhelmingly from Mozambican ports with main destination being Brazil) and all of Africa (6,709,327). Naturally all of this is according to what has been documented and excluding voyages with unknown itineraries, obviously the estimates will be higher.